What fun to be a guest blogger on Quilting Gallery. My name is Lesley Riley. I am a life-long resident of the Washington DC area, mother of 6, grandmother of 5. 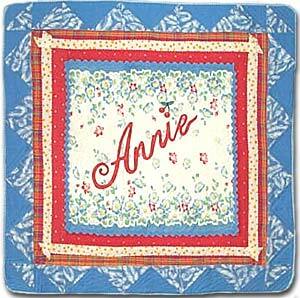 I began quilting in 1971, a baby quilt for my first born. You might think that by now all my children and grandchildren have their very own handmade quilt. Well my story is not as simple as that. I am a quilter at heart but my love of fabric has taken me on an amazing journey into art quilts and mixed media, writing, teaching, TV and DVDs. The one constant throughout is fabric. I started out as a traditional quilter with Ruby McKim’s 101 Patchwork Patterns as my guide, but soon answered the lure of the early art quilters from the 70s, like Michael James, Beth Gutcheon, Nancy Halpern, Radka Donnell and Molly Upton. I can’t say I became an art quilter back then. I was too afraid. It took much longer for me to find my confidence and my voice. 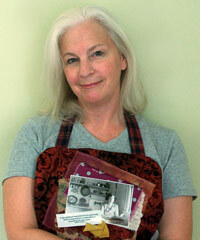 I set aside my quilting for many years to raise a family and grow a business with my husband. The lure of fabric persisted and my stash continued to grow of course. The older I got and the longer I was away from quilting, the more I felt that there was something missing in my life. One cold January day in 1999, when an ice storm had left us without power for days, my first Fragments were created. Not knowing what to do or where to begin, I just started combining photos and quotes with scraps of fabric into collages. They were small fragments of fabric collage created in small fragments of time. I did have 6 children after all. In my Fragments, I had taken everything I loved and stitched them together into something that resonated with me I didn’t know or care if anyone else would like them. I didn’t have time for quilts but I still wanted to create with fabric. I was happier creating 100 of these simple, small pieces than one large quilt. I needed instant gratification as a motivation to keep going. There’s a saying, "do what you love and the money will follow." I wasn’t in it for the money, but those Fragments were the beginning of a very busy and successful career in art quilting and mixed media fabric art. I began to teach for two simple reasons – 1) People wanted to know how I created my art; and 2) I wanted to share what I had finally learned at the ripe old age of 45 – that happiness comes from the inside and for me, it came from making art, from creating. It was what made my life complete and I wanted to make sure other women had access to that happiness. I wanted to reach as many women as I could. It’s much easier today to find a like-minded soul (or 10 or 100), but even 10 years ago, finding your "tribe," women who share a similar passion and love of creating, were hard to find. Never having ventured far from home, my teaching has now taken me to places I only dreamed of seeing (Australia, Italy), and allowed me to meet and share a love of fabric with woman all across America, literally from sea to shining sea. I am blessed. One day, after seeing my fabric & photo art on my website, a publisher called and asked me to write a book. Another dream fulfilled. Maybe you have seen or even own one of my books, Quilted Memories, Fabric Memory Books or the latest, Fabulous Fabric Art with Lutradur. And here’s another childhood dream fulfilled – I am also a magazine editor. My mom was a magazine junkie and raised me well. I love every detail from writing to photos to page layout. I loved being my high school yearbook editor but it never went any further than that. When Quilting Arts editor Pokey Bolton said she was thinking of starting a new mixed-media magazine, I said, "If you do, I want to be a part of it," never dreaming that she would take me seriously. Today I am a contributing editor for Cloth Paper Scissors magazine. I am afraid that I am beginning to sound like an obnoxious cocktail party guest who goes on and on about herself. I share my story only to be a real example of what can happen when you follow your heart. It is more important to me to share what I know at this point in time than to create prize-winning quilts or enter quilt shows. I have had quilts in invitational and juried shows over the years, but for now, I go where the path leads. There’s plenty of time left for that dream to come true. My latest venture is as an entrepreneur. I found a new photo transfer product that I believe in enough to create a business around. I debated this for over a year but all along, it just seemed like the right thing to do. I have learned over the years that the little voice inside of my head is usually right, and I should not let fear or doubt get in the way. While my children and 5 granddaughters may not all have a quilt of their own, they do have a mother/grandmother who sets the example of a life well-lived. I’ll slide another quote in here – "If momma ain’t happy, ain’t nobody happy." I have so much to give my family because I finally learned to give myself the joy (and mental health) that comes from making art. I chronicle the intersection of art and life on my blog. 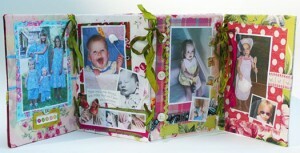 I’m a big fan of give-aways on my blog, so I am offering one here on Quilting Gallery too! Enter to win my new book, Fabulous Fabric Art with Lutradur PLUS a package of TAP (Transfer Artist Paper). Just leave a comment below, and a random winner will be chosen on March 2nd, 2009. Great giveaway! You are so terrific in so many different media! 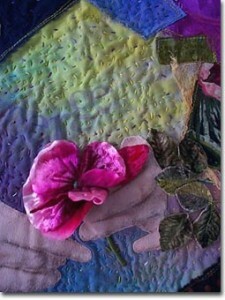 I love the pictures of the snuggly art quilts you have made. I have made only one – for my first grandbaby! Leslie, I am one of the hundreds of thousands of women whom you have inspired. I am at the sunset of my life after a 31 year professional career thinking like you thought way back then. I loved my profession, but I always felt I was sacrificing my creative self. Now, I am doing what I wished I could do. I relish the fact that you found your path. You have made it easy for me to soak in all your discoveries, productions, and give free reins to my creativity. Thank you for your story. I had the good fortune to attend one of Lesley’s workshops a couple of years ago at Valley Ridge Art Studio in Wisconsin. She is a gifted teacher who generously shared ideas and materials. It was the first time I had the opportunity to work with Lutradur and I love it. I own both of her previous books and a Fragment and would love to be a winner of this giveaway. Lesley is truly an inspiring artist and woman. Wow!! Maybe this will be third time lucky for me Lesley?!! I hope so! I love reading your story, it inspires me every day of my life! TFS! Lesley, you have a great story…it is always encouraging to read how others use their gifts to inspire. I bought some TAP and will be using it today, after surfing around to find examples of others success. It would be nice to receive this book!! Inspiring story…not boring at all. Can I be the “random winner”? Please. hi, i would love to be in the draw to win your giveaway . i have always been interested in transfere methods,sounds exciting. I am trying hard to wind your book and TAP papers. I keep entering, perhaps this will be the time. Thanks for offering your give aways. I keep trying to win this book. Maybe this will be the time. Thanks for being so generous. so inspiring to me. Just finished my first transfer using transparencies and gel medium. Will purchase TAP soon. Great to read your story after seeing your name so many times. Will be taking a class with you next week in D.C. and really looking forward to it. Lesley, Wow. (WOW) You have had an amazing life, and of course you have taken advantage of opportunities and hard work. I have your first book and love it. Unfortunately, our family business took me away from the quilting and fabric art I did when I was younger and I am just now getting back into all of it and really-it is such a joy. I wish I had spent my life creating and teaching-but life took me elsewhere, which is truly ok…I am blessed beyond words. Thank you for your willingness to share and encourage those of us on the path behind you! As a resident and veteran of DC ice storms (we were iced over night with a storm warning in effect), I’ll be checking out your blog to find your stomping ground! How many printers can a quilter need to get good printing???? Thanks for constantly reinforcing the truth that what’s important is the enjoyment and self-fulfillment – it’s too easy to get sidetracked into a bad case of the ‘shoulds’. I love hearing your sory. thanks for sharing it. Thanks for the link to this site through your inkjet transfers group! I’ve been inspired by your Cloth/Paper/Scissors articles. My focus is multimedia portraits. Leslie your art and your life story are so inspiring to so many. I am thankful to see your work and read your books for working with fabrics. I know how to sew, I just never used fabric in my art, until recently! Lesley your art and journaling are so inspiring. It’s nice to know there are other kindred spirits out there that enjoy working with mixed media and fabrics. When I need a little creative inspiration I know I can always find it just by clicking onto your blogs. Thanks again (oh and please enter me in your fun giveaway too). Hi Leslie, it’s fun following you around the Internet! I’m discovering great new sites as we go! I love this site. I bought some Lutradur some time ago and have no idea what to do with it. Would love to have the book. I love give aways, even when I don’t win, which is ALWAYS! LOL!